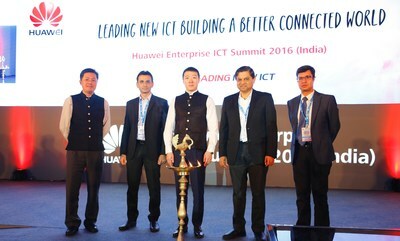 Huawei, the global leader in information and communications technology (ICT), conducted its third annual Enterprise ICT Summit 2016 by showcasing its latest products and services for its enterprise customers. The products and services for sectors like BFSI, smart cities, Power and e-Governance were on display that could potentially change the way these industry functions. The Summit, which is an initiative by Huawei to reach out to its network, and reiterate their importance in the growth of its business, witnessed a wide range of innovative ICT products and solutions in the fields of Cloud Computing, Big Data, Internet of Things, SDN, Data Centers. Huawei also shared success stories about digital transformations implemented in government and public sectors, financial services, transportation, power and education. The two-day summit witnessed participation of over 900 partners, enterprise customers and industry experts from sectors including BFSI, Power, ISP, Government, Railway and Education, for achieving multi-win outcomes. During the summit, key themes like cloudification and the integration of technology across verticals were discussed that are responsible for the delivery of the Information and Communications Technology (ICT) solutions that are solving the many unique problems of this rapidly changing world. The need for safer and smarter cities using technologies, such as Internet of Things (IoT)-based security protection, video cloud storage, and Big Data analytics were all deliberated on during the course of the summit. Ernest Zhang, President, Huawei Enterprise Business Group in Southeast Asia said, "The digital economy is changing the way we work and live. New ICT technologies in the digitalization era are also optimizing business models and opening up new market opportunities. To help the business world seize new opportunities and address upcoming challenges, Huawei remains committed to building a better connected world and a strong industry ecosystem relying on continuous innovations and open partnerships, leading new ICT transformations and helping enterprises stay ahead in increasingly competitive markets." Derek Hao, President, Huawei India Enterprise Business Group said, "The emergence of maturing digital technologies and increasing economies of scale is disrupting many industries around the world. Companies that embrace this disruption and adopt new ICT to drive digital transformation have the opportunity to gain a decisive competitive edge." In the fast-changing digital world, Huawei will cooperate extensively with key partners across India to solidify a thriving ecosystem, and work closely with its customers to drive digital transformation that meets their specific industry needs while building a better connected world.